In my earlier blog of RPA, “Robotic Process Automation and The Testing future” , I introduced RPA and described its benefits over traditional Automation. In this blog, I will glorify on impact of RPA on testing, opportunities created by RPA, how existing testing will get dissolved into RPA and RPA tools available in the market. Let’s have a look at testing techniques and its current market share. Today, across IT industry we know that 75 to 80 % of testing work is carried out by Manual testers. 20 to 25 % of repetitive work is automated using traditional automation techniques. Example: Selenium, QTP, Load runner etc. And, about 4 to 5% of work is done by Robots using RPA, mostly in BPO, finance and insurance sector. See below Pie chart. 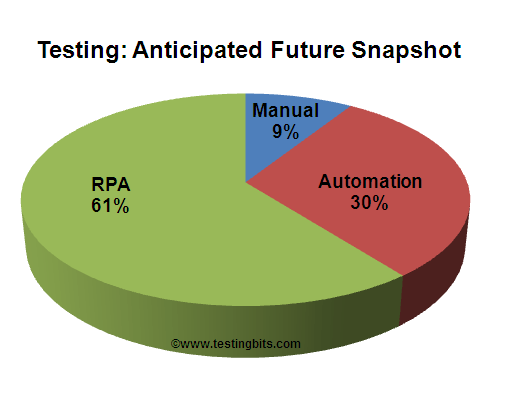 What will happen to current testing share, due to ingress of RPA in IT industry? The way RPA is gaining popularity, 5 to 6 years down the line, majority of testing work (repetitive tasks) will get automated using RPA. However, RPA for non- repetitive tasks may take some time, as current RPA softwares available in the industry are not very matured, they have just started enhancing Artificial intelligence and Machine learning into it. And this evolution will take place gradually over the period of time. Let us see how much RPA will contribute in Testing by 2025. Note: In above pie chart figures mentioned are for demonstration purpose only. 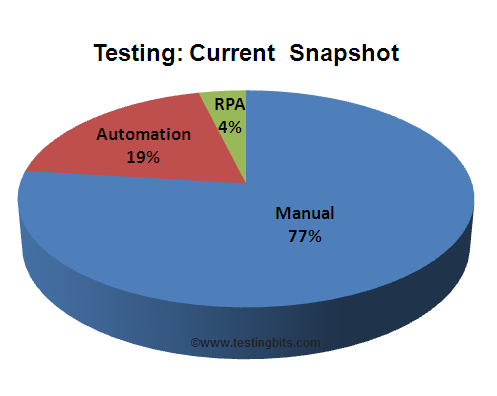 As shown in above pie chart, in future, Robots will do 50 to 60% of testing tasks. 20 to 30% testing tasks will be automated using traditional automation and Manual testers will contribute 10 to 15%. Why? and how RPA will dominate testing market share? What will be its impact across IT industry? If we compare the current and future anticipated pie charts, you can see that there will be a huge reduction in Manual testers workforce, due to industry wide cost pressure, time to market, accuracy and other benefits which discussed in my earlier blog. Not all the sectors such as healthcare, insurance, finance, automotive and education will quickly adapt to RPA, but slowly this evolution will take place. And few sectors or companies will remain reluctant to traditional automation or manual testing. Already invested in traditional automation and system has been automated 90 to 100%. Complex systems integrated with different sub systems, so fear of loosing customers, if something went wrong in production. So, majority of RPA opportunities lie in the areas where still Manual testing is used and for those who want to automate the testing. RPA will dominate IT industry, as it is platform independent also independent of the programming language in which software is designed. User can easily automate any application which can be a web based, mainframe based, desktop, mobile application and even if it is running on virtual machine etc. and regardless of the programming language (Java, .Net). Is there any impact of RPA on Manual and traditional Automation testing Jobs? Unfortunately the answer is Yes, however Manual and traditional Automation will have there presence, as anticipated in above pie charts. But, we might see reduction in the Manual and Automation testing opportunities. As, Robots (i.e. through RPA) will do the majority of work. Sooner or later we need to upgrade our skill set to train the Robots. So, get set ready to learn and teach Robots. You can post your thought in comments section. Click here to subscribe this blog. Click here to test your RPA understanding now. Stay tune to know about difference between RPA and traditional Automation. Very interesting article. I like to here more about RPA. Excellent article! Keep it coming! Yes, definitely Janardhan, You can. From my experience I would say UiPath is good to start with for learning RPA. what are the skill set we need to know and upgrade to train the Robots ? I am new to Pega BA role and now I want to know about the OOTB capabilities and frameworks?. I searched all details on PDN but unable to find any suitable data. Anyone, please have any link or referenced material. Hey Thanks Kevin. I will check if I have some useful data to share with you.